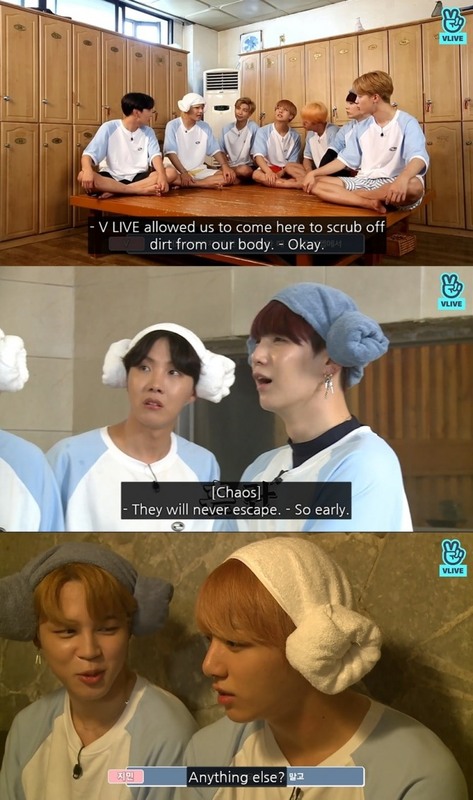 The latest episode of “Run BTS!” -- a web variety show featuring the wildly popular K-pop boy band -- takes place in an authentic Korean spa. And the bandmates are in proper attire -- the uniform T-shirts, comfy shorts and cute head towels. “We are here to have a bath. V Live has allowed to scrub off the dirt from our body,” said V at the start of the 61st episode, unveiled via V Live on Tuesday. Then the members were told they were supposed to play games, as usual, with the winner getting a prize and the loser getting a penalty. The first round took place in the changing room. The second was inside a dry sauna. Two members were presented with a quiz on new acronyms and abbreviations that young people in Korea use on the internet and social media. The first player to get the answer would escape. The loser would have to play another round against a new opponent. When the 61st episode ended, a clueless Jimin was sweating in the sauna when his new contender, J-Hope, came in. Outside, RM and Jin, who had been in the sauna already, warned Suga and V, waiting outside for their turn, that they would soon be “living” there. Watch the new episode of “Run BTS!” at https://www.vlive.tv/video/102446. 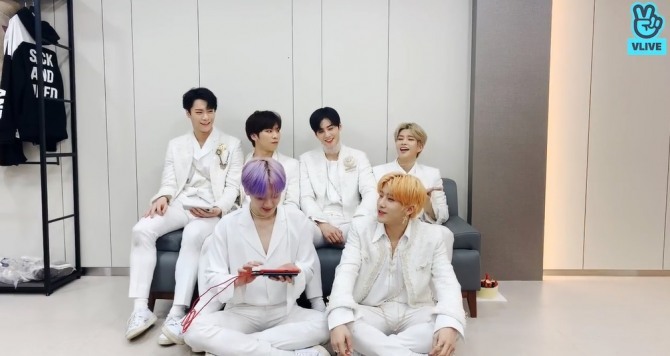 The six-member K-pop boy band Astro went live Tuesday, right after its first-ever win on a TV music chart show. “Since our debut and even before, from our trainee days, we have been working hard for this day. To reach the No. 1 spot. Aroha got us there,” said Rocky on V Live, referring to the group’s fan base. He was the first to address the viewers, and soon the other band members took their turns. Sanha expressed his gratitude to his parents. When Astro won, he said, he’d been overwhelmed and had forgotten to mention his family. The bandmates tried not to cry during the livestream, saying they had cried too much on the air. But some, including Cha Eun-woo, couldn’t help it. Watch Astro’s broadcast at https://www.vlive.tv/video/111133. Pledis Entertainment released a dance video of Seventeen’s “Good to Me” via V Live on Tuesday. The video, three minutes and 10 seconds long, features the act’s 13 members executing perfectly synchronized moves in a dimly lit dance studio. It came just a few days after the release of a similar video for “Home,” the album’s title track. Watch the “Good to Me” dance video at https://www.vlive.tv/video/111142.